AFRICA/IVORY COAST - Appeal for elections that "consolidate peace, justice and social cohesion"
Abidjan (Agenzia Fides) - "Ivorians, let us make the difference with our political maturity. Each of us must engage in our sector and promote elections that consolidate peace, social cohesion and justice. Let us make our electoral process a moment of joy and not of hate, a moment of fraternity and not hostility. Only together can we win". This is the appeal of Father Michel Savadogo, of the Society for African Missions, Executive Director of the "Réseau Shalom de Transformation de Conflit et de Reconciliation" (REST-COR), released in view of the municipal and regional elections that will be held next 13 October in the Ivory Coast. While the electoral campaign has officially been opened, speaking to Agenzia Fides, Father Michel said that "after the October 13, 2018 elections, the Ivory Coast will need all its sons and daughters to advance towards social and human development". "We must engage in an electoral process that consolidates peace and social cohesion in justice through concrete, individual and collective actions. In order for the universal right to peace to prevail, we invite every actor to fully assume his responsibilities with humanity", he points out. In his appeal sent to Fides, the REST-COR Director points out some firm points for the candidates: to adopt an honest behavior to prevent possible conflicts; use non-violent language, respectful of differences of opinion, political, religious, regional or ethnic affiliations. Finally, he invites voters to "fulfill their duty as citizens, respecting people, opinions and structures". Addressing those who intend not to vote, Fr. Michel invites them to "conduct constructive debates in favor of the consolidation of peace and coexistence while respecting differences". To the personnel committed to guaranteeing safety Fr. Father Michel Savadogo asks to "become ambassador of peace, nonviolence and reconciliation in places where they will be at service", and to journalists to "commit themselves in strict observance of professional ethics, to carry out journalism of peace and nonviolence". 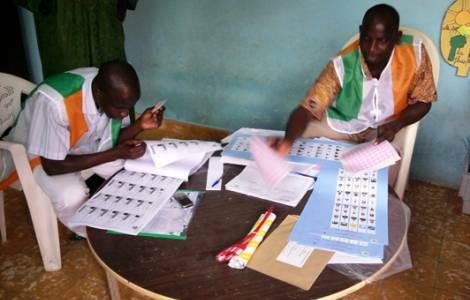 Along the same lines as REST-COR, the president of the Independent Electoral Commission (CEI), Youssouf Bakayoko, declared: "We all have a duty to organize fair, transparent, reliable and credible elections in a peaceful environment. This is a great test to show the world that our country is permanently committed to the normalization of institutions, social cohesion and peace".